Work: Admitted to the Bar, 1774; Member, Secretary, Provincial Congress of Georgia, 1776; Member, Georgia Committee of Safety, 1776; Elected to the Continental Congress, 1776, 77, 1780, 81; Colonel of the First Georgia Militia, 1778; Governor of Georgia, 1779; Chief Justice of Georgia, 1783-89; Presidential Elector, Governor of Georgia, 1789; Superior Court Judge, 1789-98, US. Senator, 1795. 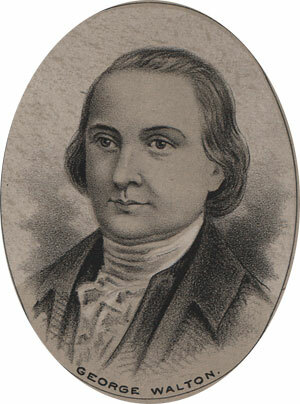 George Walton was born in Prince Edward County, Virginia, in 1741. His parents died soon after, and he was adopted by an Uncle who apprenticed him as a carpenter. Little else is know about his early years. He appeared again in 1769 when he moved to Savannah and began to study Law. He was admitted to the Bar in 1774. Deeply involved with the patriot movement in Georgia, he would ultimately serve an important role in the development of the state. At the formation of the Georgia provincial Congress, Walton was elected Secretary, and made President of the Council of Safety. In 1776 he was elected to the Continental Congress, where he signed the Declaration of Independence. He spent many of the following years engaged in the defense of his state, and in a messy political battle with Button Gwinnett, another signer from Georgia. In 1778 Walton was commissioned a Colonel of the First Regiment of the Georgia Militia. He was injured in Battle and taken prisoner. He gained his freedom in 1779 through a prisoner exchange and was soon after elected Governor of Georgia, an office he held for only two months. Political conflict colored all of Walton’s career. He was allied with General Lachlan McIntosh in a fierce struggle against Gwinnett for political dominance of the state. Walton was dispatched from office on several occasions, indicted for alleged criminal activities on others, in an interminable battle between two factions of the patriot movement in Georgia. He was returned to congress in 1780 and stayed through 1781. He remained in Philadelphia until 1783. That year he was censured by the legislature for his involvement in a duel which led to the death Gwinnett by the hand of his rival, commissioned to treat with the Cherokee nation in Tennessee, and appointed Chief Justice of his state. In 1789 he served in the college of Electors and again elected Governor. The government was reorganized under an new constitution in November of that year, at which time Walton stepped down. He was immediately appointed a superior court judge. In 1795 he was sent to fill an unfulfilled term in the US Senate. He was not reelected. He then retired to farming. He died in Augusta in 1804 at the age of 64.